This article describes how to use metadata search to search your code and metadata for arbitrary patterns and content. Given the large volume of the code base and metadata, it is often necessary to find things in the code that meet a certain criteria. Often times you may not know the name of the metadata element that contains the pattern or meets the criteria. 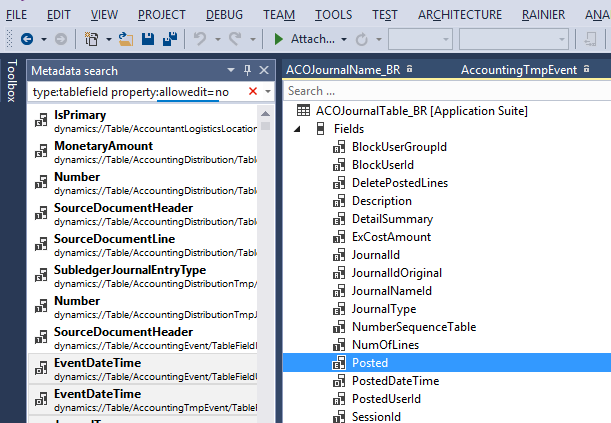 Metadata search is exposed in Visual Studio through two user interfaces: the Metadata Search tool window and the Navigate To window. You can access the Metadata search tool window from the Dynamics 365 > Metadata Search menu command. Enter your search query to start the search. Results will start populating in the window asynchronously as you type. You can double-click any result line to navigate to the corresponding X++ code or metadata that matches your search query. You can also select one or more results, right-click, and then add these elements to a project. You don’t need to wait for the search to complete before you start interacting with the search results. The Navigate To window is invoked using the Ctrl+‘,’ (the comma character) shortcut keys. Pressing Ctrl+‘,’ displays the query entry box in top right corner of the Visual Studio main document window. You can also access the Navigate To window from the Visual Studio Edit menu. Enter you search query and see the results appear as you type. A progress indicator will stop when the search is complete. You don’t need to wait for the search to complete to start interacting with the results. This section describes the search query syntax and provides example queries. The search query is a search string that consists of a set of filters in this general form: <filter_1>:<filter_1_value> [<filter_2>:<filter_2_value>… [ <filter_N>:<filter_N_value>]] Where <filter_i> is one of the acceptable filter names, and <filter_i_value> are comma separated (and possibly quoted) filtering values. Name: Filter by element name. This is the default filter, meaning if you just type a filter value, it is assumed to be an element name. Each comma-separated value is an acceptable element name. Model: Filter by model name. Each comma-separated value should be the name of a model in your application. Code: Filter using code snippets, use quotes around code snippets. The matching source code is the elements that contain the specified code snippet. You can get help about using filter and filter syntax by opening the drop-down menu available in the search box.! TrvExpTable If the token is by itself, it is assumed to be the name. So this will find everything in the application that has ‘TrvExpTable’ in the name. type:form ccount Finds all forms that have ‘ccount’ in their names. 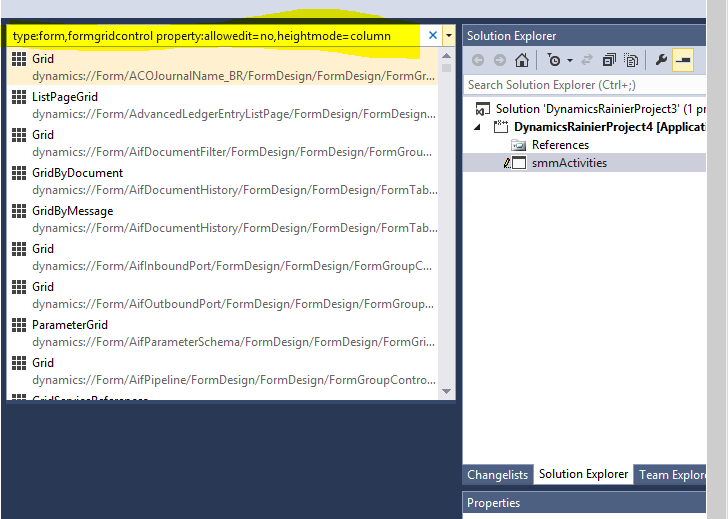 type:form property:formtemplate=listpage Finds all forms that contain the property ‘FormTemplate’ equal to ‘ListPage’. type:table,formDesign property:"WorkflowDataSource=TrvExpTable" Finds formDesign nodes under tables, nothing would be found. type:form,formmenufunctionbuttoncontrol property:Text=@SYS311998 Finds all menu function button controls with the Text property equal to (a label) ‘@SYS311998’. type:table,method name:insert Finds tables with a method containing ‘insert’ in the method name. type:table,tableindexfield name:xpNum Finds table indexes with ‘xpNum’ in the index field name. type:table,tablefieldgroup name:EPNew Finds FieldGroups (in tables) containing ‘EPNew’ in their names. type:form,formgridcontrol property:allowedit=no,heightmode=column Finds form grid controls, with properties allowedit equal to ‘no’ and heightmode equal to ‘column’. type:form,formDesign property:"WorkflowDataSource=TrvExpTable" Finds all forms with the 'WorkflowDataSource" property in the FormDesign node set to the value "TrvExpTable." model:”Application Suite” type:formdesign property:style=simplelistdetail Find all forms in Application Suite model that has the style property set to simpleListDetail in the FormDesign node. code:”return null” Finds all places in the source code that contains “return null”. code:"element.lock()" type:form Finds all places in the forms source code that contain the snippet ‘element.lock()’. code:"insert" type:table,form Finds all places in the source code of either forms or tables that contain ‘insert’. code:"public display" type:form,method Finds all form methods that contain the code ‘public display’. type:formbuttoncontrol property:text= Finds all form Button Controls that have empty text properties.